Oxford University Press, USA, 9780195304251, 278pp. As everyone knows, the United States Constitution is a tangible, visible document. Many see it in fact as a sacred text, holding no meaning other than that which is clearly visible on the page. Yet as renowned legal scholar Laurence Tribe shows, what is not written in the Constitution plays a key role in its interpretation. Indeed some of the most contentious Constitutional debates of our time hinge on the extent to which it can admit of divergent readings. In The Invisible Constitution, Tribe argues that there is an unseen constitution--impalpable but powerful--that accompanies the parchment version. It is the visible document's shadow, its dark matter: always there and possessing some of its key meanings and values despite its absence on the page. As Tribe illustrates, some of our most cherished and widely held beliefs about constitutional rights are not part of the written document, but can only be deduced by piecing together hints and clues from it. Moreover, some passages of the Constitution do not even hold today despite their continuing existence. Amendments may have fundamentally altered what the Constitution originally said about slavery and voting rights, yet the old provisos about each are still in the text, unrevised. 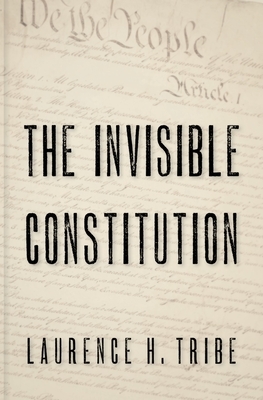 Through a variety of historical episodes and key constitutional cases, Tribe brings to life this invisible constitution, showing how it has evolved and how it works. Detailing its invisible structures and principles, Tribe compellingly demonstrates the invisible constitution's existence and operative power. Remarkably original, keenly perceptive, and written with Tribe's trademark analytical flair, this latest volume in Oxford's Inalienable Rights series offers a new way of understanding many of the central constitutional debates of our time. Laurence H. Tribe is Carl M. Loeb University Professor and Professor of Constitutional Law, Harvard University. He has published more than 100 books and articles, including American Constitutional Law, On Reading the Constitution, and Abortion: The Clash of Absolutes. In addition, he has argued more than three dozen cases before the Supreme Court of the United States and has frequently testified before Congress on a broad range of constitutional issues.